This study examines fits and misfits between information processing requirements and capacities in a hospital emergency department in order to identify possible explanations for the “weekend effect.” Previous research has shown that acute patients admitted to hospital emergency departments on a weekend experience, on average, worse outcomes than those admitted on a weekday. Why the weekend effect exists remains unclear. Based on an ethnographic field study conducted in an emergency department and by applying an information processing perspective, my findings indicate multiple changes in the organizational design that leads to substantial misfits which appears to be an explanation to why the quality of care provided by the emergency department differs on weekdays and weekends. The findings provide a new and more nuanced perspective on the causes of the weekend effect by investigating the setting in which patient care is delivered, and how it varies between weekdays and weekends. A large number of studies have shown that, on average, patients admitted to hospital emergency departments on a weekend experience poorer outcomes than those admitted on a weekday (Aylin et al. 2010; Barba et al. 2006; Bell and Redelmeier 2001; Cram et al. 2004; James et al. 2010; Ruiz et al. 2015; Sharp et al. 2013). This phenomenon is called the “weekend effect”, and it is defined as differences in outcomes (e.g., 30-day mortality rate, length of stay, number of adverse events) experienced by patients, admitted and treated on a weekday versus on the weekend. The weekend effect has also been documented in Danish hospitals, including two emergency departments (Biering et al. 2016; Duvald et al. 2018; Kristiansen et al. 2016; Vest-Hansen et al. 2015). Despite extensive literature demonstrating relatively poor outcomes for admissions to hospital at the weekend, and despite various suggestions as to why the weekend effect exists, there is a lack of literature explaining the weekend effect (Webb 2011; Bray and Steventon 2016). The answer why the weekend effect exists, remains unclear. Previous studies of the weekend effect focus on whether or not the weekend effect exists, and propose various possible explanations for the weekend effect without investigating them. In particular, two possible explanations have been discussed: does the weekend effect reflect the characteristics of the admitted patients, the health care provided, or both? Existing studies state the possibility that patients admitted on weekends are more critically ill than those admitted on weekdays. The classical studies of the weekend effect are based on administrative data, which contain limited information on illness severity. A limited number of studies use clinical data. They found that patients admitted on weekends were sicker than those admitted on weekdays. However, after adjusting for proxies for illness severity, they show that the weekend effect does indeed exist; indicating that the higher mortality for patients admitted on weekends was independent of changes in illness severity (Biering et al. 2016; Duvald et al. 2018). The weekend effect could also be an “organizational issue.” Motivated by Bell and Redelmeier (2001), one of the most commonly cited potential causes relates to the health care provided and more specifically to staffing on weekends, e.g., reduced number of staff or levels of staffing (Aylin et al. 2010; Barba et al. 2006; Barnett et al. 2002; Cram et al. 2004; James et al. 2010). There is some evidence for the importance of number of employees, e.g., the patient-to-nurse ratio and number of general surgical physicians, when it comes to weekend mortality (Neuraz et al. 2015; Ozdemir et al. 2016). Thus, prior research focuses on individual elements of the organization, such as people, e.g., the number of employees and their competences. However, if the reason for the weekend effect is lower staff and competence level at weekends, how does this change within the organization affect other parts of the organizational design? There is a lack of empirical literature that examines the organizational processes of emergency department care and provides a more holistic view on the changes within the organization, that might explain the weekend effect (Becker 2008; De Cordova et al. 2012; Goddard and Lees 2012; Hamilton et al. 2010; Lilford and Chen 2015). The present study investigates the relationship between the weekend effect and organizational processes in an emergency department. The central research question concerns how differences in the emergency department’s ability to process information on weekdays and weekends may affect the quality of patient care. Taking an information processing perspective (Burton et al. 2015; Galbraith 1973; Puranam et al. 2012; Tushman and Nadler 1977) allows me to explore organizational changes in a complex interplay between multiple parts of the organizational design, such as the structure, various coordination and control mechanisms, task solving and collaboration in the organization, as well as the collaboration between organizations, e.g., the collaboration between the emergency department and the other hospital departments. Thus, by using an information processing view, this study provides a more holistic approach to organizational changes when exploring explanations for the weekend effect than previous studies investigating individual parts of the organization such as the number of employees and their competences. I capture the complexity that characterizes the work in an emergency department (Long et al. 2008), and in which we have to search for explanations as to why the weekend effect exists. Galbraith (1973) described information processing as a design problem where information processing requirements are matched with information processing capacities. A good match or fit has been shown to result in higher performance, while a mismatch will result in lower organizational performance (Donaldson 1987). A mismatch in the emergency department’s capability to process information may be a possible explanation as to why the quality of care differs on weekdays and weekends. I use the information processing model presented by Tushman and Nadler (1977) to analyze an emergency department’s capability to process information on weekdays and weekends and thus as a tool to identify fits and misfits between essential organizational elements. The case chosen for the analysis, is a Danish hospital emergency department in which differences in outcomes for patients admitted on weekdays and on weekends have been demonstrated (Duvald et al. 2018). Based on an ethnographic fieldwork with emphasis on participant observation and interviews, this study will determine how organizational processes differ between weekdays and weekends. Ethnographic fieldwork is an in-depth research method in which the researcher is present in the organization for an extensive period of time (Hammersley and Atkinson 2007). From the ethnographic analysis, I found that the amount of information that must be processed in the hospital emergency department is high. Clinical staff has to interpret and analyze large amounts of data (e.g., patient histories, clinical examinations, lab results) in order to perform individual tasks, i.e., diagnose and treat various acutely ill patients. How clinicians gather this information in order to make decisions about what to do next is fundamental, making an information processing perspective highly relevant when investigating differences in how an emergency department is organized on weekdays and on weekends. The information processing perspective remains central in organizational design theory (Puranam et al. 2012). In an information processing perspective, an organization is considered an information processing system, which processes information to perform tasks and to coordinate and control its activities (Burton et al. 2015). Various media are available to facilitate information processing, for example face-to-face communication, computers, networks, and various information technology. A basic proposition is that the greater the uncertainty of the task, the greater the amount of information that must be processed by decision makers during the execution of the task (Galbraith 1973). Uncertainty is lack of information; that is the difference between information possessed and information required to complete a task (Tushman and Nadler 1977). Lack of information and thus uncertainty can be due to unpredictability, or due to lack of knowledge. Uncertainty is low if an information processing demand originates from routine and predictable tasks that are well understood prior to performing them, and rules and programs are ways to handle information requirements. If the task is complex or poorly understood, then more knowledge is required during the actual task execution and thus information processing requirements are high (Burton et al. 2015). Based on this information processing view, Tushman and Nadler developed the information processing model shown in Fig. 1. 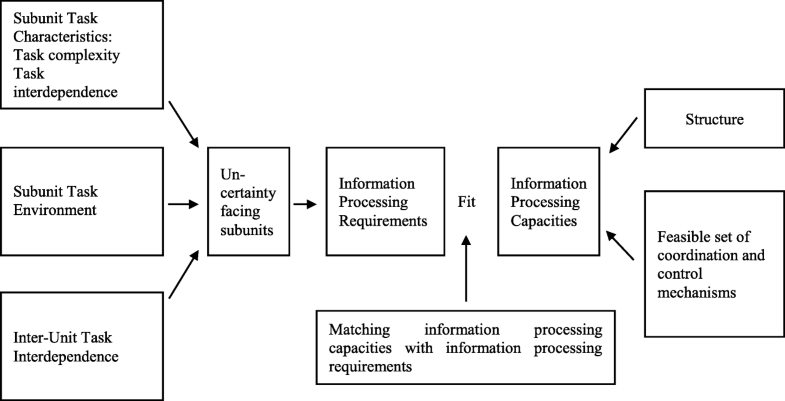 When analyzing information processing requirements, three sources of work-related uncertainty are essential to look at: (1) subunit task characteristics regarding task complexity, i.e., extent of predictability and task interdependence, (2) subunit task environment, and (3) inter-unit task interdependence, i.e., the degree to which a subunit is dependent on other subunits to enable effective task performance. In addition, organizations with different structures and kinds of coordination and control mechanisms have different capacities for effective information processing (Tushman and Nadler 1977). The information processing model presented by Tushman and Nadler is one of many contingency theories, which is an organizational theory that claims that there is no one best way to organize; however, not all ways of organizing are equally effective, and optimal organization is contingent on the internal and external situation (Galbraith 1973; Scott and Davis 2014). However, Tushman and Nadler's model is based on earlier contingency theories, including Burns and Stalker’s various approaches to structuring organizations, Galbraith’s identification of a range of coordination and control mechanisms, and Lawrence and Lorsch’s perspective that different environments (with different levels of uncertainty) put different demands on organizations (Tushman and Nadler 1977). Thus, the analysis presented in this paper is based on several classical contingency theories. Tushman and Nadler presented their model more than 40 years ago. Over time, contingency theory has become elaborated and has been extended including ever more elements on which the design of organizations is contingent (Scott and Davis 2014). One example of a new model, which also builds on the information processing view and integrates earlier contingency theories (e.g., Miles and Snow’s strategy, structure and process model, and Galbraith’s star model), is the multi-contingency design model developed by Burton and Obel (2004). Their model includes the elements of goal, strategy, environment, structure, task design, people, leadership and organizational climate, coordination, control and information systems, and incentives, all of which must be aligned to achieve optimal performance in an organization (Burton et al. 2015). However, some of these components are irrelevant for this analysis either because of the setting or because they do not really change during the week. Others have redeveloped the theory trying to refine our understanding of information processing in organizations. Inspired by Weick, Daft and Lengel (1986) added another reason why organizations process information, namely equivocality, which means ambiguity or the existence of multiple, conflicting interpretations regarding the organizational situation. As opposed to uncertainty, equivocality cannot be mitigated through gathering more data; it requires additional processing mechanisms that include exchange of ideas and creation of answers. One of the most recent theoretical contributions to the information processing perspective is the epistemic interdependence perspective presented by Puranam et al. (2012). This perspective builds on a distinction between interdependence between agents and between tasks; that interdependence between tasks need not imply interdependence between the agents performing these tasks, and interdependence between agents, in turn, does not imply a need for information processing between them (Puranam et al. 2012, p. 420). Unlike task interdependence, interdependence between agents depends entirely on the reward structure: are agents rewarded for individual actions or for the result of the actions of more agents; this structure makes agents interdependent on each other’s actions (Puranam et al. 2012). Despite these more recent theoretical contributions to the information processing view, in this paper I use Tushman and Nadler’s classical information processing model as my analytical tool to highlight the complexity and interdependencies between essential organizational elements of the emergency department on weekdays and on weekends. This rather simple model allows me to determine various differences in how the emergency department operates on weekdays and on weekends and to examine both the hospital departments' interdependence and the three sources of uncertainty which are recognized as typical of hospital settings (Gardner et al. 2015). As demonstrated by the literature, little is known about the reasons for the weekend effect (Lilford and Chen 2015). Qualitative approaches are particularly suitable when we seek to understand a social situation about which our understanding is limited, as is the case in this study. Since the study explores possible explanations for the complex but delimited phenomenon of the weekend effect, this study is based on a single case (Yin 2004); data were collected through prolonged ethnographic fieldwork in a hospital emergency department. Over time, the use of single case studies has been criticized (Eisenhardt 1989), but single cases allow in-depth investigation of a phenomenon providing rich description and understanding (Walsham 1995). Ethnographic fieldwork can be defined as firsthand experience and exploration of a particular social or cultural setting based on (though not exclusively through) participant observation (Hammersley and Atkinson 2007). As the researcher spends much time in the “field,” observing what people do as well as what they say they do, ethnography is well suited to provide researchers with a nuanced and in-depth understanding of the people, the organization, and the broader context within which they work. The aim is to provide an empathic understanding of the employees' daily activities. The fieldwork took place in an emergency department of a Danish hospital. In 2007, a major reorganization of the Danish health care sector was launched. Overall, the redesign entailed centralization of the acute care; the intention was to increase quality and specialization of hospital admittance as well as to develop capacity to manage an expected increase in the prevalence of comorbidity. The number of acute hospitals was reduced from 40 to 21, and acute patients, who in the past were admitted to specialized acute surgical and medical wards, are now sorted in centralized hospital emergency departments. As a result of the reorganization, emergency departments have become the cornerstone of the Danish National Health System. Up to 70% of all acute patients are examined here to determine which care is needed, and many patients are discharged without further admission, because they are treated in the emergency department (Danish National Board of Health 2016). The Danish National Board of Health guidelines published in 2007 were inadequate and imprecise. As a result, Danish emergency departments differ in organizational design. Further, many emergency departments’ organizational design changes in the course of the day and the week (Møllekær et al. 2018). For this study, one of the emergency departments, whose organizational design changed during the day and week, was chosen. Little is known about how such changes in the design over a short time period affect the quality of care and services provided by the emergency departments. The Emergency Department at Viborg Regional Hospital, Regional Hospital Central Jutland is one of five Central Denmark Region emergency departments receiving trauma patients and critically ill patients. The emergency departments receive patients referred by general practitioners and patients who have called 112 (the Danish emergency number). The Viborg emergency department employs 145 nurses and physicians. With backing from physicians from other department, all acute patients with referral diagnoses covering general surgery, orthopedic surgery, and internal medicine are diagnosed in the emergency department. Children, other than those treated in the emergency room, are received in the pediatric department, and patients suffering certain heart-related incidents are directed straight to the cardiology department. Patients with psychiatric diseases are admitted to psychiatric hospitals. I did prolonged ethnographic fieldwork in the emergency department. The fieldwork consisted of approximately 700 h of participant observation (Hammersley and Atkinson 2007). In order to gain insight into all aspects of the clinical setting and all work practices in the field, I participated on a passive level (Spradley 1980). For 7 months (from August 2015 to February 2016), I followed individual emergency physicians, junior physicians, and nurses in their daily activities in day, evening, and night shifts on weekdays and on weekends. This involved following the employee and recording as closely as possible his or her activities, conversations, interactions, and use of objects over an entire shift. I participated in various conferences and meetings and observed treatment of patients, administrative work in front of the computer, and various conversations and supervisions. In anthropology, this research tool is known as “go-along” (Kusenback 2003) and in organizational studies known as “shadowing” (McDonald 2005). The observation of seemingly every-day social interactions allows me to determine the complex in the routine and the routine in the complex. Information about my data collection was published in the department’s electronic newsletter and at morning meetings ahead of the observations. The observations were planned with the different staff roles in mind. Oral consent from each employee who was followed was obtained prior to the observation. In total, I followed 39 nurses on 48 8-12-h shifts. In addition, I followed 13 junior physicians in 15 shifts of 7–16.5 h, and six emergency physicians and two temporary physicians in 14 shifts of 7.5–16 h. All patients were informed and verbally consented to the presence of the author. When appropriate, short interviews took place during observations allowing informants to attach meaning to observed transactions in their own words (Bernard 2011). Extensive field notes were written during observations to capture actions (Emerson et al. 1995). To get an even deeper understanding of everyday practice, observational data were supplemented with 25 in-depth semi-structured interviews with employees and the department management (see Table 1) (Bernard 2011; Kvale and Brinkmann 2009). To get a broad understanding, the inclusion criteria for interviewees were diversity of health care professionals and of experience. The interview guide included questions about the patient’s way through the department, roles and tasks in the emergency department, coordination, collaboration in the department as well as with other hospital departments, and leadership style. However, according to ethnographic principles, the informants were encouraged to speak freely and to raise issues of importance to them (Hammersley and Atkinson 2007). Moreover, four focus groups, with four nurses in each group, were conducted. The strength of focus groups lies in the group dynamics, which provide the researcher with elaborated perspectives on the topics discussed (Morgan 1996). Four experienced and four less experienced nurses from each section were invited to participate. The nurses discussed the department's roles and tasks, collaboration within the department and with other departments as well as some of the findings from the observations. All interviews lasted 1–2 h and took place at a quiet place at the hospital (e.g., an empty office), where the informants had the opportunity to speak freely. The interviews were recorded and transcribed verbatim (Kvale and Brinkmann 2009). All the empirical material was generated between August 2015 and February 2017. In order to understand how the emergency department is organized, private documents produced for internal purposes (e.g., work schedules, collaboration agreements, and role descriptions) as well as public documents (e.g., the reports written by the Danish Board of Health) were collected (Hammersley and Atkinson 2007). Following recognized qualitative data analysis procedures, the first part of the analysis was data-driven, and the empirical material was examined with the purpose of identifying themes through open coding, capturing differences between the organizing of the emergency department on weekdays and on weekends (Bernard 2011; Emerson et al. 1995). The preliminary themes were discussed with senior researchers laying the ground for more intense reflection. One theme that emerged from the initial inductive analysis was the emergency department’s reliance on the other hospital departments and the resulting challenges. The distinction between task environment (i.e., the environment outside the hospital) and inter-unit task interdependence (i.e., the emergency department’s dependence on the other hospital departments) in Tushman and Nadler's model (1977) enables highlighting the complex collaboration between the emergency department and the other departments, which appeared in the empirical material. Another theme was the differences in number of staff and their task performance depending on their level of experience, which is possible to highlight in the analysis by the model’s identification of capacities. Thus, the information processing model was an appropriate theoretical framework to guide the final, more focused analysis of the empirical data. In this phase, the interplay between theory and data was strengthened in the process of identifying as the theoretical concepts that could render our data meaningful and guide our final analysis (Emerson et al. 1995; Kvale and Brinkman 2009). Ethical approval was not required for this study. According to Danish law, formal ethic approval is not mandatory for studies that do not involve biomedical issues. This study was exempted from the informed consent requirements (inquiry 151/2015). The management of the hospital and the management of the emergency department approved the data collection. The emergency department chose not to be anonymized. All individuals, who participated in the study, have been anonymized. Nurses usually work one of three shifts: days (7 a.m.–3 p.m.), evenings (3 p.m.–11 p.m.), or nights (11 p.m.–7 a.m.), weekdays and weekends in Danish hospitals. Physicians usually work two shifts: days (8 a.m.–4 p.m.) or evenings/nights (4 p.m.–8 a.m.). Møllekær et al. (2018) show that the emergency department’s organizational design on weekday day-shifts differ from the rest of the shifts. The empirical material in this study confirms this. To gain further insight into the differences between weekdays and weekends in order to explain the weekend effect, the potential misfits in the emergency department’s ability to process information in the daytime, on weekdays and weekends, will be analyzed. The emergency department is divided into two subunits: A1, on the second floor, and A2, on the fourth floor. The subunits are divided not only geographically but also according to the type of patients they treat. A2 admits most of the internal medical patients and general surgical patients. A1 admits subspecialized patients such as urological and gynecological patients. The emergency room, where orthopedic surgery patients are received for short stays and the trauma rooms for critically ill patients, is placed here too. Due to their diverse tasks, the two subunits cooperate with different specialized departments at the hospital. Patients can remain in the emergency department for up to 2 days if the emergency department believes that they can treat and then discharge the patient. Otherwise, patients are transferred to other departments after initial treatment. In total, the department has 38 beds, 4 beds in the emergency room for short admissions, and 2 trauma rooms. As in other health care organizations, the emergency department uses a two-by-two management model with a physician and a nurse on each level, designed to promote teamwork between the two major professional groups responsible for patient care (Hoff et al. 2016). Besides the management of the department, consisting of a chief physician and a head nurse, an emergency physician and a section nurse formally manage each subunit, while a flow master (an emergency physician) and a coordinating nurse manage the clinical everyday life in each shift. The role of the flow master and the coordinating nurse is elaborated on later in this article. The administrative staff and nurses are employed in either A1 or A2, while the physicians do shifts in both A1 and A2. In order to find the amount of uncertainty facing the emergency department and the information processing requirements on weekdays and weekends, each of the three sources of work-related uncertainty identified by Tushman and Nadler (1977) is analyzed. Work procedures at the emergency department are characterized by a high degree of complexity; they diagnose and treat acutely ill patients, and both time and information may be limited. Moreover, the emergency department cannot predict the influx of patients; hence, the context itself holds several sources of uncertainty. Patients admitted to the emergency department have various symptoms; some have a complex mix of coexisting conditions, requiring various kinds of treatment and care. The emergency department’s goal is to decide how to treat the patient, and whether the patient can be treated in the emergency department or whether the patient should be transferred to another department. Diagnosing patients involves collecting and analyzing a lot of information as well as decision-making. When the degree of differentiations of the subtasks is high, e.g., treatment of patients with various symptoms, it is demanding to achieve effective collaboration. Much information processing and coordination is needed to integrate the various subtasks in order to fulfill the common goal of the organization (Galbraith 1974); this increases task complexity and thus information processing requirements. Another aspect characterizing task complexity is whether the tasks are familiar to the organization or not, i.e.,the tasks are standard, e.g., patients with common symptoms that are seen regularly, low task complexity, and a junior physician can solve the tasks by following a known procedure that specifies the sequence of steps, i.e., standard operating procedures (SOPs). An illness, however simple in appearance, can prove unpredictable (Strauss et al. 1997). Therefore, junior physicians must consult a senior physician when they admit and treat such patients. However, when a critically ill patient is admitted to the department, particular procedures may be required and potential solutions considered, e.g., treatment options, task complexity, and extensive information processing required. An emergency physician will see the patient immediately or within 15 min. Patients at the emergency department are in various stages of treatment. This includes newly admitted undiagnosed patients, and patients who can be treated in the department and whose discharge is expected within 48 h. Diagnosing newly admitted patients often requires more information processing than treating patients who have been admitted for a while. As time passes, more and more information becomes available. The information must be considered, but others will already have collected it and partly analyzed the information. The diagnosis of patients with multiple symptoms requires capacities that are able to process information. Not all tasks can be pre-planned, and even though a condition appears straightforward, it may suddenly change and resources must be reorganized. In addition, treatment of diverse patients requires coordination. Thus, task complexity in the emergency department generally is high both on weekdays and on weekends. In the emergency department, tasks, i.e., treatment and care of patients, are co-solved and the different subtasks are related. One example is the physicians’ use of triage colors for task prioritization. Triage is the process of determining the priority of patient treatments based on the severity of their condition. Nurses perform the triage. The flow master asks the coordinating nurse to mark patients who have not yet been seen by a physician with triage colors. The flow master tells me that he needs to know how to prioritize the newly admitted patients. The coordinating nurse calls the individual nurses who are responsible for the patients to obtain the triage colors. She puts the colors on the board allowing everybody to ascertain the triage color of the patients (Observation, flow master, day shift, Friday, October 2015). The output of the triage forms the input of the next subtask, the treatment. This is just one example of how the emergency department subtasks are sequentially interdependent (Thompson 1967). The interdependence of the individual tasks is highlighted when describing a patient’s way through the department where the patient goes through a sequence of treatment processes (subtasks). These different subtasks are (1) admission, (2) triage, (3) focused care/treatment, and (4) discharge. Patients remain stationary, and various employees solve and are responsible for each subtask (see Fig. 2). Thus, different tasks are allocated to different employees. When the patient arrives at the department, a secretary takes care of registration. Ideally, the coordinating nurse decides which room and bed the patient will have during his or her stay at the department and calls the nurse she wants to take care of the patient. This nurse does the initial triage. The nurse indicates the triage color in Cetrea (a clinical logistic system, which is a user-driven electronic information system presenting a real-time overview of work- and patient flows in the emergency department and across the entire hospital) and enters it into the electronic patient record (EPR). Then the nurse orders basic blood tests and other tests. During a shift, the same nurse or a team of two nurses take care of the patient. A bioanalyst draws blood tests and performs an ECG. Depending on the triage color and the patient's symptoms, a physician performs the initial examinations to diagnose and treat the patient. If necessary, physicians from other departments are consulted. The physician outlines a short initial plan in the EPR and dictates the plan for treatment of the patient, which a secretary enters into the EPR. After stabilizing the patient or attending to the patient’s basic needs, the physician decides whether the emergency department can treat and discharge the patient within 2 days. If not, the patient is transferred to a relevant department. These sequential processes are visualized in Fig. 2. The processes can be divided into three interdependent parts: (1) input, (2) throughput, and (3) output (Asplin et al. 2003). The different capacities (e.g., physicians available for solving the tasks) is illustrated too. The sequential process not only takes skills of those solving and responsible for the individual subtasks but also coordination. The organization processes information to coordinate and control its activities. 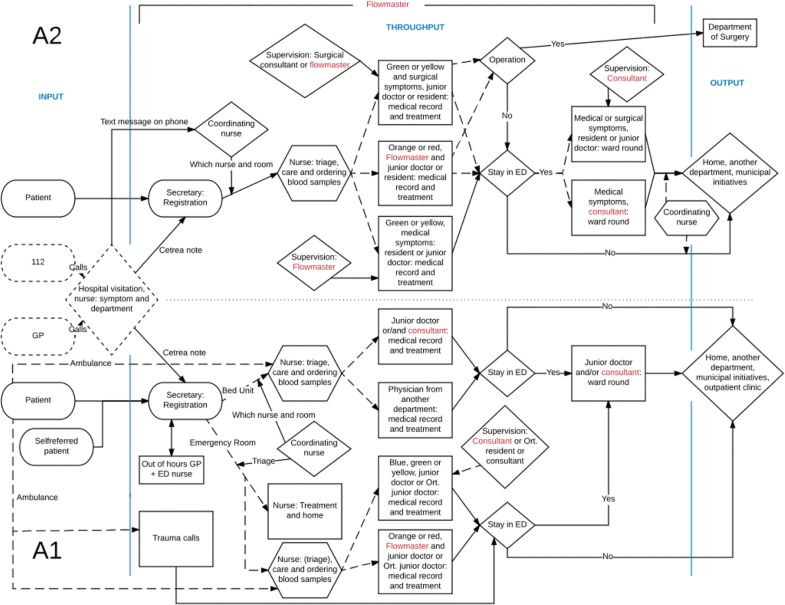 The figure shows some of the information flow, e.g., notes from Cetrea and coordination mechanisms, e.g., the coordinating nurse function, that the department has created in order to permit coordinated action across a number of interdependent subtasks. The coordination mechanisms will be elaborated on later in the article. In a multitude of ways, the employees depend on other to perform their individual subtasks in order to get the patient through the treatment system. Nurses await the coordinating nurse’s decision about which nurses will take care of newly arrived patients, and they cannot enter the triage score in the EPR until the secretary has registered the patient. The nurses await the physician' plans for the patient so they know what they are expected to do, and before they can make the initial plan, the physicians need the test results. As regards decision-making, junior physicians wait for supervision from more experienced physicians. To coordinate patient transfer from the emergency department to other departments, the coordinating nurse must wait for the physicians to decide whether the patients are to remain in the department or not. As described, emergency department tasks are co-solved, and the staff is highly dependent on others to perform their individual subtasks in order to get patients sequentially through the treatment system. In high complexity cases , e.g., if a patient is seriously ill or has coexisting diseases, even more employees are involved in the treatment, more tests are ordered, and the patient’s stay in the department may be longer. This co-solving design makes task interdependence in the emergency department high both on weekdays and on weekends. A breakdown in any small subtask can shut down the process. Hence, the action sequence requires not only skills of those solving and responsible for the individual subtasks but also coordination, joint decision-making, and joint task solving. It involves more uncertainty and consequently increased information processing (Burton et al. 2015). The fact that most of the actors are assigned to eases collaboration in the department and the co-solving process. The emergency department’s environment, which consists of factors such as the Region, cooperating municipalities, and patients, is dynamic and ever changing, which increases the uncertainty facing the emergency department both weekdays and weekends. One factor that boosts task complexity, but which also makes the environment dynamic, is patient diversity, e.g., that the emergency department cannot predict the influx of patients or their symptoms. This specific kind of uncertainty faced by emergency departments is called input uncertainty (Argote 1982). The volume of patients in need of acute care varies, and the department must always be prepared to care for fluctuating numbers of more or less acutely ill patients with different symptoms. This factor has a substantial impact on workflow patterns, as the emergency department and the health professionals must adapt to a rapidly changing environment that requires dynamic shifting of resources to meet patients’ needs. Usually, the department management makes the decisions. Now, with the emergency department, many stakeholders must be heard, there are many opinions, there are many consensus solutions to be found along the way internally at the hospital, but also externally with the primary care set-up and general practitioners. All our collaborators(…) many have a view about how the emergency department should manage patient pathways (Interview, April 2016). Moreover, these decisions increase the uncertainty facing the emergency department. The department managers said: “Sometimes we get an order to start up something where we are not quite ready, but then somehow you become ready” (Interview, April 2016). One example is the Region's decision, that a senior physician must be present in the emergency department 24/7. At that time, the emergency department lacked emergency physicians, and a poor environment (i.e., a general lack of emergency physicians) impedes hiring more physicians (Chitale et al. 2013). The strategy chosen by the emergency department was to outsource the work, and they contracted with a group of individual consultants who could help cover the shifts at the department (Burton et al. 2017). The competences of these temporary physicians are elaborated when the information processing capacities are analyzed. In order to provide sufficient care and treatment for incoming patients, emergency departments in numerous ways depend heavily on subunits, i.e., other departments at the hospital. Physicians from other departments are on call, many patients are transferred to more specialized departments after initial treatment at the emergency department, and tests are performed by other departments (e.g., the clinical laboratory and the radiology department). Moreover, on a daily basis, a number of physicians from other departments solve various tasks at the emergency department, including two residents, one from the medical and one from the surgical department, who admit patients 24/7 to the emergency department. The surgical resident is in fact the only one (supervised by a surgical consultant) who can decide whether patients must undergo surgery. These physicians from other departments are involved in treatment, and the emergency department is dependent on how and when these physicians process information. An example: The coordinating emergency room nurse says that maybe they should call the resident from the department of orthopedic surgery again to ask when he is coming. Five patients are now waiting for him. Soon after, the resident shows up. The coordinating nurse says with a smile “There he is, set about it”. The junior physician tells the resident that five patients are waiting for him. The resident is surprised. He says that they have been operating for a long time and in the meantime, more and more patients are waiting for them. He apologizes for the waiting time (Observation, junior physician, evening shift, Monday, January 2016). The collaboration with the other hospital departments involves lots of uncertainty. One of the reasons for the high level of uncertainty is that the physicians do not prioritize emergency room tasks. A surgical department resident said: “We plan our own tasks. We solve tasks in the operating theater and participate in X-ray conferences, and the rest of the time, we solve tasks in the emergency department. We try to be in the emergency department as agreed, but if an X-ray conference is taking longer than usual, then we will arrive later rather than abandoning the X-ray conference” (Interview, October 2015). Due to the current incentive system where physicians are rewarded and have a career path in their own specialty, physicians from other departments lack the incentive to make decisions and take action that match the needs of the emergency department. As the resident indicated, he obviously preferred to operate, and the work in the emergency department was just something he had to do. Consequently, the emergency department does not know when the physicians show up or which level of experience they have. The following field note shows that the unknown level of experience is subject to uncertainty: The emergency physician enters the room, greets the patient, and begins asking questions. The patient addresses the emergency physician, and the resident steps back watching the emergency physician take over (…) Later, when we are returning to the board, the emergency physician says, that she is a little worried about the physician from the medical department. She does not know the physician or what his/her level of experience is (Observation, flow master, day shift, Friday, October 2015). The emergency physician is concerned about the resident's skills and the level of treatment the patient gets. The outcome is that two physicians solve one subtask, and the information processing demands increase. Two dimensions affect the organization’s information processing capacities: the structure and the kinds of coordination and control mechanisms that the organization uses (Tushman and Nadler 1977). The emergency department's overall task is treatment and care of patients, and nurses and physicians solve these tasks. The nurses operate either alone or in teams of two, and every nurse or team has a number of patients. Depending on the patients' symptoms and their degree of illness, physicians with different specialties, experience, and department affiliations treat the patients. Mostly, the emergency department’s junior physicians (supervised by emergency physicians) undertake the treatment. In addition, a number of physicians from other departments solve tasks at the emergency department. Some physicians are called in when their skills are needed, e.g., when a patient with neurological symptoms is admitted to the emergency department, a nurse will receive the patient and call the physician with the specialty in question. The patient’s needs are often the controlling element in the treatment carried out in the emergency department. Some physicians show up un-called and solve tasks as per the collaboration agreements. Treatment is done physically at the emergency department in cooperation with junior physicians and nurses employey in the emergency department, physicians from other departments solve the various tasks. These physicians work in the emergency department alongside the emergency department physicians. They participate in the organization but the command structure and incentives differ from those of the emergency department physicians. The emergency department has a matrix structure (Burton and Obel 2004; Galbraith 1973) supported by contracts with the specialties outlining how the tasks of every specialty must be solved (Burton et al. 2017). The structure of the emergency department is characterized by a dual focus on specialization and the emergency care process. The degree of focus on specialization is high, because physicians from many different specialties solve tasks in the emergency department, and due to the emergency physicians’ and nurses’ involvement in and coordination of the tasks, the focus on patient flow is high too. This task division offers stability, flexibility, reduces uncertainty, and ensures quality of patient care. However, on weekends, when more tasks are “outsourced” to physicians from other departments and the emergency physician is less involved in patient treatment, the focus on specialization increases and the focus on emergency care processes decreases. A consultant from the medical department does ward rounds in the emergency department in the daytime instead of an emergency physician. The tasks solved by a physician from another department (e.g., the medical department) and an emergency department nurse increases. Looking at who treats patients on weekends, the work is divided more by specialized activities: there is an increase in the number of patients with medical symptoms who are treated by a physician from the medical department, and in the number of patients with surgical symptoms who are treated by a physician from the surgical department. This change within the division of work requires more coordination. Given the task complexity, task interdependence, and collaboration with other departments, the emergency department uses various strategies in order to coordinate its activities. I distinguish between impersonal and personal coordination and control mechanisms (Van de Ven et al. 1976). Impersonal coordination (and control mechanism) is coordination by programming such as schedules and formalized rules (Van de Ven et al. 1976). The simplest method of coordinating interdependent subtasks is rules and programs (Galbraith 1974). The emergency department makes extensive use of rules and politics, e.g., SOP. Physicians use these guidelines when facing an unfamiliar task. By using the guidelines, junior physicians can solve more tasks with less supervision. Another example is the way physicians use the triage colors to prioritize tasks and divide the tasks among them. Depending on the triage color and the patient's symptoms, a physician, either from the emergency department or from another department, with a certain level of experience performs the initial examinations to diagnose and treat the patient. They all know the prioritization rules and use Cetrea to communicate which patients they are going to treat. An example: At the computer, Michael (junior physician) logs in to Cetrea, to check the list of newly arrived patients who have not yet been examined by a physician. Five patients are on the list, most of them with a yellow triage, four for surgery and one medical patient. Michael is seeing medical patients today, and he points out to me that only one patient needs to be seen. He extracts his notebook and on a blank page he writes the patient’s name, CPR number (every Danish citizen is assigned a unique central personal registration number), and the note from the visitation. He goes to the command room and activates the pencil icon on the Cetrea touchscreen allowing him to manage the board. He pushes his own picture on the board and subsequently the name of the patient such that his picture and name now are linked to the patient. (…) Michael touches the board once more making a box blue on the board. Now everybody can see that the patient record will be dealt with and that he is the physician in charge (Observation, junior physician, evening shift, Wednesday, October 2015). A lot of the emergency department subtasks and proceduresare formalized and pre-coordinated with rules such as the one just described; this allows an interdependent set of activities to be performed without the need for communication (Galbraith 1974). Thus, the interdependence between the tasks need not imply interdependence between the staff performing these tasks (Puranam et al. 2012). The work schedule outlines the role that employees will perform on the day in question. A role description is available. On the day described in the field note, Michael treats medical patients. First, he helps the emergency physician in charge of the ward rounds. At the morning conference, he got a note listing the patients he is going to see. If possible, all the patients he sees are connected to a certain team of nurses, which eases coordination between the health professionals. After the ward rounds, he sees newly admitted medical patients. Here, the triage color and the patient's lenght of stay in the department determine whom he sees first. At an operational level, this formalization helps the junior physicians make their own decisions. Because of the rules, they can do lot of their work without having to rely on an emergency physician. The rules supports standardization, reduce variability, decrease uncertainty, and consequently reduce the amount of information to be processed (Galbraith 1974). Due to formalized and pre-coordinated rules and guidelines, the formalization of the emergency department is high. However, in practice, the rules are not always respected, and not everything can be formalized as one emergency physician explained: “The role descriptions are useful if (…) you want to know the time for the various conferences. However, the work is so diverse and the days differ so much that you cannot schedule the tasks of an emergency physician. Of course, there are tasks that you are in charge of and that you are supposed to take care of, but the tasks you solve vary from day to day” (Interview, December 2015). Another coordination mechanism handling the uncertainty and supporting the matrix structure is the contracts with the other departments about which physicians must work in the emergency department. The contracts enable the emergency department to know what to expect from the other departments, thus reducing unpredictability. The emergency department engages specialists to work on very specific tasks, to treat patients with certain kinds of symptoms, but the department does not know which particular person will do the work. It is a contract for an activity (Burton et al. 2017). However, the emergency department cannot always control how or when the physicians from the other departments will perform the tasks in the emergency department. As one emergency physician said, “It is not in our power to decide how the surgical resident prioritizes his tasks. We cannot say: you have to stay here, you cannot leave this department, because of an operation” (Interview, December 2015). A more complex coordination and control mechanisms, which the emergency department applies are self-contained units, dividing the department's tasks into subunits each managed by an emergency physician. Creating subunits that can initiate and fulfill tasks autonomously without (or with less) coordination with other subunits reduces the need for information processing (Galbraith 1974). On weekdays, the task of treating patients is divided into three self-contained subunits: (1) the flow master ensures that every newly arrived patient to A2 is seen by a physician, and that the emergency department's overall task is solved. Hence, the work of the subunits is coordinated. (2) An emergency physician manages the ward rounds at A2, and (3) a third emergency physician manages the treatment of patients at A1. Each group works more or less autonomously. However, on evenings, nights, and weekends, only two self-contained subunits are in operation. The flow master (the only emergency physician on duty) must manage two subunits, one at each section, while the last subunit, the ward rounds in A2, is outsourced to a consultant from a medical department. This consultant may not inform the flow master about the work in “his” subunit, so to maintain inter-unit coordination, the flow master must call to get information. Hence, on weekends, more personal coordination mechanisms were used. Hospital visitation, which is a capacity that handles the information known prior to admission and which increases the department’s ability to preplan. When knowing in advance that a patient will arrive and his/her symptoms, unpredictability is reduced. The use of Cetrea, the user-driven electronic information system, is a way to increase the department’s ability to handle information (Galbraith 1974). Cetrea creates an overview of all the department's patients and makes it possible to communicate the information, e.g., the triage color, much faster, which decreases uncertainty. The division of the emergency department by having patients with similar diseases in the same section (floor) minimizes the need for coordination. The more heterogeneous the patients, the more varied the requisite kinds of tasks and the more varied the resources necessary for doing that kind of work (Strauss et al. 1997). To enable mutual adjustments (e.g., if a patient’s condition deteriorates) and to solve problems at the level where the problem occurs, personal coordination is another strategy used at the emergency department (Van de Ven et al. 1976). When analyzing the information processing capacity, there are two critical factors: the number of people and their competencies(Burton et al. 2015). The decision maker’s capacity and information processing skills are especially important (Galbraith 1974). In each section, the role of the flow master and coordinating nurse are two parallel coordination mechanisms that secure a lateral flow of information among the sub-units (Galbraith 1974). They are the matrix managers and based on the priorities of the patients, they allocate time to the employees. Based on information (e.g., from Cetrea and the EPR as well as informal information from the employees), they monitor the various processes in the patient’s treatment to ensure that the process is kept on track (Burton et al. 2015). The overall nurse task, i.e., taking care of patients, is divided into smaller subunit tasks. In teams of two, nurses care for a number of patients. One of the team nurses reads about their patients in EPR, answers phone calls from relatives, participates in conferences, collaborates with the physicians who treat the patients, and coordinates the discharge of patients. The other nurse takes care of the patients and receives new patients. The team coordinates its activities and shares knowledge about the patients. This coordination is central when focusing on effectiveness and quality of care. However, as one nurse said, “Often you do not know what the nurses in the other teams are doing and how many patients they are taking care of” (Focus group, nurses from A2, May 2016). To ensure that the overall nurse task is solved, a coordinating nurse (one at each section) coordinates the smaller units. She delegates the tasks among the teams, e.g., calls the nurse she wants to take care of new patients, and coordinates the transfer of patients with the other hospital departments. The overall emergency department nurse tasks are coordinated in the same way on weekdays and weekends. However, the number of nurses decreases on weekends. Consequently, each nurse takes care of more patients and must handle more information. The nurses discussed how this affected patient care. One nurse said: “Sometimes you have to skip things you would never skip on a weekday, (…) and on those weekends where we admit many patients, I do not observe the patients at the same level” (Focus group, experienced nurses from A2, May 2016). The A1 nurses had the same experience: “On weekends, there are not enough nurses to take adequate care of the patients for it to be safe. In the morning, you are holding your breath, working as fast as possible, and hoping that the time will run, because at 11 a.m. more nurses will come in” (Focus group, experienced nurses from A1, September 2016). The coordinating nurses collaborate with the flow master who coordinates the overall physician tasks, i.e., treatment of patients. The flow master examines all critically ill patients (red and orange triage), answers phone calls from outside the hospital, e.g., from GPs, and supervises the junior physicians who examine new patients admitted to A2. In the emergency department’s everyday clinical practice, the emergency physicians have the overall responsibility for patient treatment. In 2017, The Danish National Board of Health decided to make emergency medicine a formally recognized specialty. Hence, even though the emergency physicians have a supra-specialty in emergency medicine, they are consultants specialized in different fields and have different skills and experiences. They solve tasks, collaborate, and process information in the department in different ways. The other employees notice these differences: “It is different what the emergency physicians do and what they can do” (Observation, coordinating nurse, night shift, Sunday, August 2015). On weekdays, 3–4 emergency physicians are on duty in the emergency department, each one managing a self-contained subunit. They rotate between the three subunits: flow master, ward rounds, emergency physician at A1. If needed, they can shift resources between subunits. They are able to adapt to the situation in an organization where few tasks can be pre-planned. Moreover, they often use and complement one another’s competences. “In the daytime, if I have a question about cardiology, then I ask Peter. There are always three emergency physicians at the department and sometimes four. Therefore, it is piece of cake just to ask one of the others. However, I am at my best when I am in the emergency room. Here I can solve all tasks pretty much” (Interview, emergency physician, February 2017). The emergency physicians act as a team, and because they use one another’s competences, it is the team's competences that become important. Because of the knowledge exchange between the physicians on an as-needed basis, they increase the amount of information they can process (Burton et al. 2011). However, on weekends, only one emergency physician is on duty, and the competences (e.g., clinical, cooperative, and managerial skills) of the single physician become important. “If I have a question, then I will ask one of the other emergency physicians (…) When I work as an emergency physician on weekends, they are not there. I am the only one at duty” (Interview, emergency physician, November 2015). Moreover, the information processing capacity decreases. One emergency physician explains: “You are doing ward rounds to get patients out of the department; therefore you cannot be involved in receiving new patients. You do not have time for both. Then, at night, you will struggle withthe stuff you should have done earlier on (…) That is the worst part about the weekend and evening/night shifts. You are so damn busy that sometimes you fail to do something” (Interview, December 2015). One single emergency physician is unable to handle all the information and solve all the tasks he is supposed to solve there is too much work to do. The condition in which there is insufficient time to carry out all expected role functions is called “role overload” (Moorhead 1981). Moreover, because of a lack of emergency physicians, temporary physicians cover shifts in the emergency department—mainly on weekends. In 2015, the temporary physicians covered 0.6% of the daytime shifts and 17% of the evening/night shifts on weekdays. However, on the weekends, they covered 61% of the daytime shifts and 53% of the evening/night shifts (calculated from work schedules). Thus, usually when a temporary physician is doing a shift in the department, he or she is the only senior physician on duty, which reduces the emergency department’s ability to control their way of solving tasks. Moreover, the temporary physicians, who are consultants from other, mostly medical departments, are neither trained in emergency medicine, e.g., they lack knowledge about surgery in terms of both treatment and supervision, nor are they used to filling the role of flow master; this affects the operation of the emergency department. The emergency physicians’ work consists, in addition to clinical work, in managing, coordinating, and prioritizing the department's entire physician resources. Informants mentioned the temporary physicians’ lack of experience in terms of how to coordinate the work in the department. “As coordinating nurse, I often ask our emergency physician if we can add the plans for the patients to the Cetrea touchscreen. If I ask the temporary physician, they do not know what to do. They are not used to thinking along these lines” (Focus group, experienced nurses from A2, May 2016). When a temporary physician works as an “emergency physician” on weekends, the professionalization of the workforce, measured by skills, knowledge, and capacity to both generate and process information, decreases (Burton et al. 2015). One of the consequences of the emergency physicians' lack of time and the temporary physicians' lack of knowledge to supervise surgical treatment issues was that the junior physicians, especially those who solve tasks in the emergency room, got less supervision. “You act a bit like a cowboy (…) Also, you know that if you have done something that is absolute nonsense, then they will discover it at the conference (an orthopedic consultant reviews all the X-rays), and the patient is called in the next day. You have a safety net, so to speak” (Interview, junior physician, January 2016). On weekends, the capacity changes, and it becomes harder to match the capacity (physician) with the task (treatment of the patient). Sometimes the result is “rework.” The failure probability of a work item, here the wrong treatment of a patient, depends on the complexity of the activity and the match between the skill requirement and the responsible physician’s range of skills. The junior physician making a decision beyond his competences will trigger an exception report process and new decisionmaking. Failed work items need rework to maintain quality, in this case re-treatment (Jin and Levitt 1996). The emergency department also used “scheduled group coordination mechanism” to coordinate activities (Van de Ven et al. 1976), e.g., the morning conference. On weekdays, the emergency physician guided the morning conference. All physicians attended, the nurses and therapists participated too, and the focus was the plan for each patient. On weekends, a medical consultant guided this conference. Only physicians and the coordinating nurse attended, and the focus changed to which physician would see each patient. This change of focus resulted in delayed plans for the patients and a lack of information that the coordinating nurse needed to prepare the discharge or transfer of patients, which is an important task that needs solving to make room for new patients. “As coordinating nurse, I do not get the information I need for the following conference with the other departments, where I am supposed to know how many patients I expect to transfer to other departments” (Focus group, experienced nurses from A2, May 2016). In order to maintain the level of performance, the nurse had to gather the missing information elsewhere. She developed a new strategy asking the nurses who took care of the various patients a time-consuming task sometimes they could not give her the plan for their patients because they did not know it either. Consequently, the change in focus impeded the patient flow, a challenge that might affect the patients’ length of stay at the department on weekends and reduced the emergency department’s capacity to care for new patients. When looking at the combination of the three sources of uncertainty, the work-related uncertainty facing the emergency department on weekdays and weekends is high and the information processing requirements are extensive. This is due to the task complexity and the level of interdependence between co-solved tasks. A dynamic and changing environment and the emergency department’s interdependence of the other hospital departments also affect the uncertainty. When the nature of the task solved by the department is highly uncertain, the need for a constant flow of information increases among both the employees and the physicians from other departments solving tasks at the emergency department (Tushman and Nadler 1977). New information becomes important, and adjustment of resources and needs is necessary during task solving. In many ways, the information processing capacities (i.e., the structure, and the various coordination and control mechanism that the emergency department has developed) fit the extensive information processing requirements the department faces. Table 2 shows the match between the uncertainty facing the department and the department's capacities to cope with these uncertainties. In addition, the differences between weekdays and weekends are illustrated. At the emergency department, there is a fit between the high level of uncertainty and the choice of a matrix structure, which can handle much more information than other organizational structures and provides for flexible utilization of resources, and the amount of varied coordination mechanism. However, on weekends, more tasks are “outsourced” to physicians from other departments, who solve the tasks in their own way, e.g., the morning conference. Moreover, these physicians often have to prioritize between tasks at their own department, e.g., surgery, and tasks at the emergency department. The structure focuses more on functional specialization and is less service oriented. This change in work division requires more coordination, but at the same time, coordination decreases on weekends. This is due to the limited number of emergency physicians working on weekends. The emergency physician, who is acting matrix manager, has limited time (and skills, if it is a temporary physician) to coordinate tasks because of another task: treatment of critically ill patients. He is neither able to process all the information nor to solve all the tasks. The lack of emergency physicians also means that the use of self-contained subunits decreases on weekends reducing flexibility in the department and that even more information must be processed. Moreover, less experienced junior physicians, who cannot get the needed supervision, solve more tasks. On weekends, there is a misfit between high task complexity and task interdependence. The emergency physician must process a high level of competences (i.e., clinical and coordination skills), and a fair number of emergency physicians on duty (and skills if it is a temporary physician) is required. The risks of breakdowns in sequential treatment increase on weekends. The capacities do not match the requirements. Because of all these organizational changes the emergency department patient flow is more obstructed on weekends as compared to weekday dayshifts, and patients wait longer to be seen by a competent physician. When analyzing the emergency department's requirements and capacities, the information processing requirements are extensive on weekdays and on weekends, whereas its information capacities are high on weekdays, but lower on weekends, due to a reduced and less effective set of coordination and control mechanisms. Table 3 shows the relation between needs and capacities. On weekends, the information processing capacities in the emergency department decrease, and therefore the capacities are not sufficient to deal with the high work-related uncertainty. Capacities and requirement mismatches are associated with lower organizational performance (Tushman and Nadler 1977), and more informants noticed that this mismatch affected patient care. Due to the mismatch seen on weekends, decisions made in the emergency department will be based on sub-optimal information, treatments will be delayed (e.g., patients wait longer to be seen by the right capacity), and patients may have to stay longer at the department. Extended length of admission at the hospital's emergency departments is associated with higher risk of errors and increasing costs (Hoot and Aronsky 2008). The misfits may thus be one explanation of the weekend effect. Patients should be able to expect the same standard of emergency care regardless of which day of the week they are admitted. However, more than 100 studies have demonstrated that patients admitted to hospitals on weekends experience worse outcomes compared with patients admitted during the week, and emergency patients seem to be most affected (Lilford and Chen 2015; Wise 2016). Despite the “weekend effect” being well documented, the causes of this effect are unclear (Bray and Steventon 2016). This study shows that due to extensive information processing requirements and a reduced and less effective set of coordination and control mechanisms, there is a misfit between the information demands and capacities on weekends, making the emergency department less efficient. However, another study (Duvald et al. 2018) comparing weekday and weekend admissions to the emergency department in the same period as the empirical data for this study was collected shows that fewer patients attend the emergency department on weekends. In addition, more patients were critically ill (triaged red or orange) and more patients were transferred to the intensive care unit when they were admitted on weekends. The emergency department should be designed in a way that enables it to handle the diverse characteristics of patients admitted on weekdays and on weekends. The lower number of patients admitted to the emergency department on weekends may fit with the decreasing coordination and control mechanism. However, more critically ill patients admitted on weekends increases the information processing requirements and thus the need for information processing capacities. One solution to this problem is to fix the identified misfit by adjusting the organizational design. Reorganizing the emergency department so that the information processing capacities would match the demands, then the patient care offered on weekdays and weekends would be more uniform thus minimizing the weekend effect. Some of the misfits in the emergency department’s information processing could be solved by increasing capacities, e.g., by hiring in more emergency physicians. Due to the Danish Board of Health decision to create a specialty in emergency medicine, this may eventually become possible. Hiring more physicians specialized in emergency medicine would increase the skills in the emergency department and decrease uncertainty (e.g., their dependence on other departments and having to rely on temporary physicians). Moreover, patient care on weekends would no longer be dependent on a single senior physician’s skills but on a team as on weekdays, and the emergency physicians would be able to handle clinical, coordinating, and supervision tasks. Another solution is to decrease the uncertainty, that occurs in connection with the emergency department’s dependence on other departments, by changing the incentive and reward structure. Today, there is an asymmetric interdependence between the emergency department and the other departments. The physicians from other departments have no incentives to solve emergency department tasks, and as a result, they do not prioritize these tasks. Furthermore, they have no incentive to solve these tasks in ways that are better aligned with the emergency department's process focus. Inspired by Puranam et al. (2012), this challenge could be met by modifying the reward system and developing agent interdependence on a department level at the hospital. Thus, the other hospital departments and the emergency department would be rewarded for effective and efficient task solving, i.e., treatment of patients whose symptoms requires involvement of physicians from more specialized departments. Broad incentives would develop a more symmetric interdependence between the departments (Puranam et al. 2012). Both solutions, hiring more emergency physicians and changing the incentives/reward system, could increase the quality of patient care and decrease patients’ lengths of stay at the emergency department. The theoretical approach to information processing has been useful for investigating possible explanations for the weekend effect in a Danish emergency department setting. By building on contingency theory, the information processing model provides a conceptual framework to identify variations in the emergency department’s organizational design on weekdays and on weekends and for analyzing complex organizational challenges in a systematic way (Tushman and Nadler 1977). Contingency theory has been criticized for being too static and failing to deal with organizational change (Donaldson 2006; Van de Ven et al. 2013). However, based on empirical data, the information processing model is used to analyze the emergency department’s capability to process information on weekdays and on weekends; the results show that the organization of the department varies during the week. Thus, by using the model, I am able to identify organizational changes in the emergency department. However, due to its simplicity, the model does not specify a direct way of incorporating social practices into organizational analysis - social practices that might influence or be influenced by the misfit identified by using the model. The information processing model thus offers only a partial account of reality (Astley and Van de Ven 1983). To gain a more comprehensive understanding of a dynamic organization and the differences between weekdays and weekends, further research is needed. The core finding of misfits between information processing requirements and capacities may not be the most interesting finding in this study. The reduced number of employees (and their competence level) on weekend duty may be an expected finding as it is one of the often-mentioned suggestions in previous literature as to the existence of the weekend effect. However, the analysis also shows that it is not only the people component, i.e., decreased number of employees and competence levels, which changes, other components in the organizational design of the emergency department change too (Burton et al. 2015), which existing literature has not pointed out. For example, my analysis shows that the emergency department has a less effective set of coordination and control mechanisms, which is yet another component of the organizational design. Some of this is due the department's delegation of tasks among the employees on weekend duty, e.g., the emergency physician on duty could have headed the morning conference on weekends but this task was filled by a medical department consultant. Another part is due to the decreased number of emergency physicians, e.g., the decreased number of self-contained subunits. Thus, when the people element changes, a ripple effect is created, and other elements of the organizational design, including the coordination and control element, change too. This means that even minor understaffing may lead to substantial misfits and lower performance in the organization. This paper shows that the weekend effect cannot be explained by only looking at individual parts of the organization such as the number of employees and competences. It is a much more complex interplay between interrelated organizational design elements all having a significant performance effect and therefore influence the level of patient treatment at the department. Thus, this paper nuances the debate about why the weekend effect exists. By investigating the setting in which patient care is delivered, and how it varies across different organizational circumstances on weekdays and weekends, an information processing view and the use of ethnography combined provide a new perspective on the causes of the weekend effect. A strength of this study is the use of qualitative methods. The observation of and interviews with both management and employees about how the emergency department is organized and how the tasks are coordinated and solved by different employees on both weekdays and weekends gives a detailed and in-depth picture of the organization. The qualitative methods enable capturing the complexity of patient care thus providing insight into possible reasons for the weekend effect. Although longitudinal field research seems particularly well suited to studies of organizational changes in emergency departments on weekdays and weekends, like all studies, this one also suffers from limitations. This study is based on fieldwork, which took place in 1 of the 21 Danish emergency departments, and the emergency department’s strategy for dealing with shortage by outsourcing shifts to a group of temporary physicians, who act as “emergency physicians” once a month, may be unique for this case. However, the challenges described in this study (e.g., the physicians from other departments lack of incentive to solve tasks at the emergency department and the limited number of emergency physicians on duty on weekends) are observed in several Danish emergency departments (Duvald et al. 2015; Duvald et al. 2016a; Duvald et al. 2016b; Duvald et al. 2016c; Møllekær et al. 2018). The emergency departments in Denmark are still under development, some of the variations in the organization on weekdays and weekends may exist because of a managerial focus on getting the organization to function in the daytime on weekdays. I would like to thank the employees and managers at the emergency department at Viborg Regional Hospital, Regional Hospital Central Jutland, for enabling me to visit their department to observe their daily operations. Data and material will not be shared, due to that data are based on individuals.